The dedication and fire you have for creativity has no boundaries as you can choose an emphasis in several fields. What you learn outside of the classroom setting will also go a long way toward a successful career. 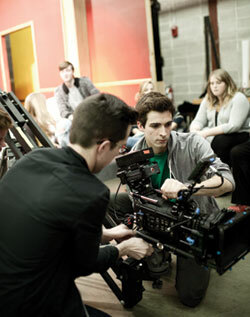 This specialization includes film studies and production. Our cinema studies curriculum takes a liberal arts approach in studying cinema history, criticism, and theory. You will be prepared for advanced academic work, in addition to media careers in film criticism, film programming for museums, festivals and universities, and the expanding film distribution arena. You will learn about writing for film, animation, digital production, optical printing, advanced sync sound production and work independently or in group productions in areas including documentary, experimental, narrative and animated film. The program provides paths for a career as a filmmaker for a variety of venues and opportunities based on your own interests. The fine art photography program encourages you to realize your own personal visions. Study topics include digital imaging and large format photography and allow for experimental darkroom and camera techniques. There are opportunities for individual artistic expression through studio workshops and advanced courses. The commercial photography emphasis offers the chance to learn professional skills in areas including large format photography and digital imaging. The program explores advertising, illustration and publication/editorial photography. Advertising students learn how write ad copy, brand products and plan advertising and marketing campaigns. In addition, students study the evolving legal and ethical landscape created by online advertising. The program prepares students to enter a wide variety of positions with marketing communications firms including advertising, sales, promotion, public relations, and direct marketing agencies. In this specialization, students can experience the rewarding aspects of a Broadcast News or online news career: gathering, reporting, producing, and broadcasting of information needed by members of the local, national, and world communities. Courses give students opportunities for practical experience using the SIU Broadcasting Service PBS/NPR stations, WSIU-TV and WSIU-FM and the student-operated radio station WIDB. The photojournalism specialization will allow you to not only capture just the right moment in a still photograph, but teaches how to add audio and video to reports. Photojournalism students receive practical training in gathering, writing, photographing, editing, and presenting news and feature stories in which the essential information is photographic. The proliferation of sports programming in both traditional and new media is triggering an increasing demand for graduates with sports production, sports promotion, and sports journalism backgrounds. The School of Journalism and the Radio, Television, and Digital Media Department have joined forces to establish specializations in both academic units. The School of Journalism’s specialization has two tracks. One prepares students for sports reporting, the other for sports promotion. The reporting track includes new sports courses and the essentials from the news/editorial specialization. The promotions track adds new sports courses to the essentials of the advertising specialization. New media skills will be integrated across the journalism curriculum, with advance coursework available. New Media News Production gives students a strong sense of aesthetics and design, and a deep understanding of how to communicate effectively through websites using text, audio, and video. You can choose courses that center on digital arts creation, creative storytelling, and computer animation. Digital media artists and animators write, design, and create computer animation, digital audio and video for delivery across an array of media platforms. Here, you use digital methods and innovative forms to creatively explore and critically comment on the arts, media theories, and technologies that are shaping the future of media. Gather, report, produce and broadcast information to the community, nation, and world. WSIU-TV and WSIU-FM provide practical opportunities to apply what you learn in the classroom, and the department is home to the award-winning River Region Evening Edition daily news broadcast. These opportunities give you the chance to build a portfolio of broadcast work that is seen and heard in a three-state region. Your focus in this specialization will be on the business side of radio and television, learning about copywriting, audience research, programming, promotion and sales. There are numerous stations across the country owned and run by SIU Carbondale alumni, many of which offer internship opportunities. You will learn about work in radio, music business, music recording and audio production for video or multimedia. Class projects are produced in several state-of-the-art, digital studio environments. There are many opportunities for hands-on experience through the two campus radio stations -- student run WIDB, and WSIU-FM , which is an NPR station. Immerse yourself in digital media production, with an emphasis on conceptual development, visual storytelling, scripting and digital post-production. You will hone your production skills as camera operators, directors, and editors with WSIU-TV. You also have the chance to be involved with a variety of award-winning TV programming, including the “alt.news 26:46” news magazine and in-studio concerts that air on WSIU. The proliferation of sports programming in both traditional and new media is triggering an increasing demand for graduates with sports production, sports promotion, and sports journalism backgrounds. The School of Journalism and the Radio, Television, and Digital Media Department have joined forces to establish specializations in both academic units.